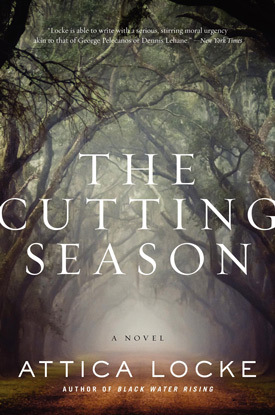 If Toni Morrison were to write a traditional murder mystery, it would likely look something like Attica Locke’s The Cutting Season. This is not to imply that the novel rehashes well-trod themes, but that instead it highlights Southern plantation history with new insight and evocative language. The Cutting Season tells the story of the Belle Vie Plantation, both as a modern-day tourist destination and as a blemish on our historical past. By documenting murders that occur generations apart, Attica Locke demonstrates the validity of that old adage about history repeating itself. Caren Gray is the main character in the novel. As the story opens, she is back working as the manager of the Belle Vie Plantation’s tour services and event management. Having grown up on the plantation where her mother was the head cook, Caren has returned here after dropping out of law school and suffering through a break-up. Raising her daughter, Morgan, in this setting seemed like a good idea until the morning that Caren stumbled on the dead body of a migrant worker from the attached sugarcane fields. While Caren is hesitant to get involved in the police investigation, when it becomes clear that Morgan might know more than she is saying, she is left with no other choice. When evidence starts to show that the present-day murder may have links to a missing persons case from years previous, Caren finds herself in the middle of a puzzle that includes property ownership, illegal workers, racial discrimination, and corrupt politics. And to make it worse, it looks like she is being followed. Attica Locke manages to evoke the events of the past in a clear and concise manner, while never losing sight of the fact that the story is rooted in the modern day. The supporting cast of characters are well-defined and help to enhance the overall themes inherent in the story. The Plantation setting in post-Katrina Louisiana is fully realized in such a way that the reader can almost feel the air around the place and hear the blades cutting the cane in the fields. The Cutting Season could easily have fallen into melodrama without the skill with which Attica Locke wields language. The novel is easy to read, but the reader can sense the depth of power behind the words. Huge themes like greed and pride resonate throughout the novel and yet, never become preachy. This is the skill of a true storyteller. It is no wonder that Dennis Lehane chose to make Attica Locke’s The Cutting Season the first book released under his new publishing imprint with HarperCollins. Readers who skip this book will be poorer for having done so. This is a fantastic new site for mystery readers. And even for those of us who perhaps might not ordinarily gravitate toward mysteries…I can easily preview a reviewed book and see if it piques my interest. Thank you, BOLOBOOKS. Wow… I am going to buy this right now! A great site for those of us who enjoy a good mystery!